in California, Florida, Texas, North Carolina and Georgia states. as well as the only adopted Forensic Science supplier in Texas! Curriculum development has traditionally followed the mechanical standardization format found in the industry. Schools look for the "machine" that is most likely to produce the final "product" of acceptable quality and train their teachers how to run it. Teachers start on page one and see how far they get by the end of the school year. TPS has built a toolbox, not a machine. Just like any skilled professional, the teachers select the best "tool" for the given situation. The toolbox consists of four drawers: Traditional lessons, STEM projects, Art activities, and Ancillary materials. Since all materials align specifically to educational standards, they align to each other and are interchangeable. The standard addressed and all mathematical practices incorporated are printed on each page of the lessons. The toolbox structure allows flexibility in how each standard is addressed, giving the teacher the ability to customize instruction to best meet the needs of their diverse classroom. Flexibility and options can prove daunting. TPS provides a pacing plan for each grade level that assures that instruction is covered in a logical sequence and meets scheduling constraints. TPS also offers a bespoke service of planning for any unusual situation. For example, a given school may have an unusual schedule or need to cover certain topics by particular test dates. TPS can help build a pacing plan to deliver all content to these students. TPS provides training, using full program webinars, for all teachers and parents, at no cost, for the first introduction day. We then propose that a number of STEM webinars be scheduled as this is the component that is least familiar to teachers and parents. The P.D. provided is amazing, consisting of teachers actually doing the projects followed by discussion of implementation issues. Rather than one textbook and one approach to learning, we have found that students respond well by beginning each unit of instruction with a STEM project. This can be followed by the use of a traditional lesson plan and applying and demonstrating competency through an art modeling visual assessment. The online assessments are used before, during and after the lesson plan content is delivered. The STEM projects follow a learning cycle format of Exploring, Discussion, and Application. A traditional lesson has an introduction to ensure that what students should know is actually known or is retaught, then an activity about the new concept, followed by a summary. There is a classroom exercise, and many student exercises followed by manipulatives, problem solving, and concluded with the arts visual assessment. The program uses a variety of strategies and is underpinned by a strategy of teaching literacy with numeracy. TPS (Teachers, Parents, Students) believes that this approach will allow maximum growth of each and every child in our schools. Our video will show you who we are, how we work and what we have to offer you for Common Core Mathematics. We hope you find this informative and interesting. Please don't hesitate to get in touch with any questions or for further information. William Hunter, Director of the Center for Mathematics and Science Technology, will take you through the professional development that we can offer you. Please get in touch for further information. TPS Publishing Inc. and partners have constructed the K-8 Creative Core Curriculum for Mathematics with STEM, Literacy and Arts Program with the intent to enhance the Mathematics learning and teaching in schools. By aligning to the requirements of the Smarter Balanced Assessment Consortium and PARCC we enable teachers and parents to assist students in the application of mathematics content, and the preparation for and of passing tests. Adopted in Texas for K-8 Mathematics. TPS Publishing Inc. and partners have constructed the 'Creative Mathematics Curriculum with STEM, Literacy and Arts' program with the intent to enhance the Mathematics learning and teaching in schools. Through adhering to the Texas Essential Knowledge and Skills break outs for Mathematics, the program presents Mathematics as a way of thinking and learning, incorporating literacy skills necessary for success in acquiring Mathematics as an academic language. TPS Publishing Inc. has developed a number of products for New York state. These products include: Science is a Verb, Critical Thinking and Recycled Science among others. TPS believe that Science is something that should be done as well as discussed. Our products encourage teachers and students to ask questions, correct misconceptions, explore scientific process and use these learning methods to build a strong scientific knowledge. Adopted in Florida for K-5 Common Core Mathematics. 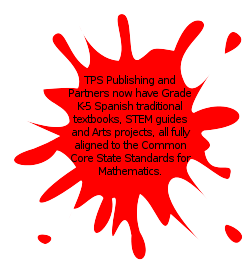 TPS Publishing Inc. and partners have constructed the K-8 Creative Core Curriculum for Mathematics with STEM, Literacy and Arts Program with the intent to enhance the Mathematics learning and teaching in schools. By aligning to the requirements we enable teachers and parents to assist students in the application of mathematics content, and the preparation for and of passing tests. The only newly adopted supplier of Forensic Science in Texas. Scientific inquiry is at the heart of Forensic Science. In our Forensic Science course, students, just as the professionals in the field, develop testable hypotheses and create logical connections between the design of the activity and the underlying scientific concepts. Students carry out investigations, collect and analyze data, formulate explanations, revising their hypothesis if necessary, re-work their investigation, and draw conclusions. 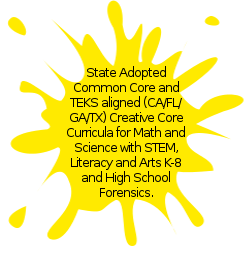 The program is aligned to the TEKS of Forensic Science through Level 1 and High School components. Now with extra chapters to meet 100% of the TEKS. We believe that a key factor in obtaining the very best results in Forensic Science is to help students master the content and skills expressed in national and state standards and assessed on their exams. Thus, we have focused upon the material students are expected to know and be able to do for their examination. We have also made the books fun and user friendly. Adopted in Texas for K-8 Science. TPS Publishing Inc. and partners have constructed the 'Creative Science Curriculum with STEM, Literacy and Arts' program with the intent to enhance the Science learning and teaching in schools. Our Science program has been approached in the same manner, and with the same ideals, as our Mathematics program. Through adhering to the Texas Essential Knowledge and Skills break outs, the program presents Science as a way of thinking and learning, incorporating literacy skills necessary for success in acquiring Science as an academic language.